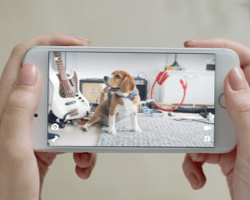 Petcube pet parents spend on average 50 minutes a week interacting with their fur kids - watching, talking, exercising and rewarding them when away from home. But your pet's activities don't stop when you're not looking. Petcube Care cloud recording service helps you capture the precious moments throughout your pet's day, so you don't miss out. Triggered by sound and motion, Petcube Care records videos of your pet and sends you an alert. The video clips are saved securely to an interactive timeline in the app for you to review later on. Whether you have an active pet or a sick fur kid who needs monitoring, Petcube Care has you covered. All Petcube users have access to the last 4 hours of video history for free. 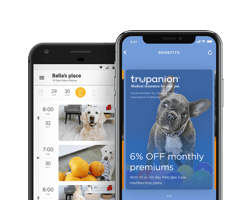 For pet parents who can't check on their pet multiple times a day or travel a lot, subscription plans with multi-day video history are available, so you never miss a moment of your fur kid. Here're 10 pawesome pet moments captured with Petcube Care. 2. Anybody there? Gib some treats? 6. Who needs vacation anyway? Always know what happened. Replay up to 10 days of activity stored securely on the cloud and only get alerts that matter. 8. Practicing my singing skills while Dad is at work. Is America's Got Talent still on?